On this date in 1926, a man went to the gallows over his headwear. An Islamic religious scholar, Iskilipli Mehmed Atif Hoca (English Wikipedia entry | German) was deeply out of step with the secular-nationalist turn of Atatürk‘s Turkey. Among Ataturk’s many modernizing reforms was a 1925 law banning traditional fezzes and turbans in favor of western lids — part of a much more comprehensive project to push religious authorities out of public influence. Our man Iskilipli had already in 1924 taken his stand athwart history in the form of a pamphlet titled Frenk Mukallitligi ve Sapka (Westernization and the Hat) — essentially arguing that the fashion choice implicitly licensed all the un-Islamic decadences of European civilization. 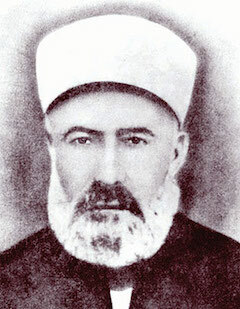 He was arrested within a month of the Hat Law’s passage, by which time the Turkish government had already encountered violent opposition to the new hats in some areas. 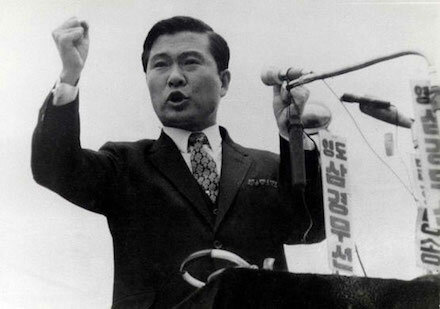 Refusing to defend himself before an “Independence Tribunal” whose verdict was preordained, he was hanged on February 4. On this date in 1952, Egypt’s revolutionary military government sent a gallows warning to the labor movement. 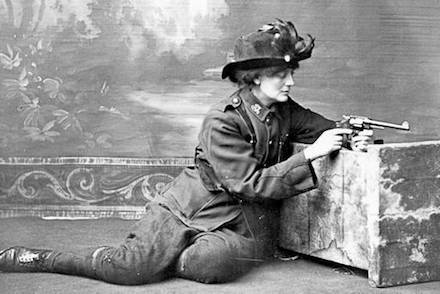 They had bold plans for their countrymen, these young officers: egalitarian land reform, pan-Arabism, release from the hated grip of colonialism. But don’t mistake that for an invitation to present just any grievance. Nasserite Egypt quashed independent labor organizing in these early years, eventually banning all union activity outside of the state-controlled Egyptian Trade Union Federation. On this date in 2016, Bangladesh hanged tycoon Mir Quasem Ali for crimes against humanity committed during that country’s 1971 War of Independence from Pakistan. Known at the time of his death as the wealthiest patron of the party Jamaat-e-Islami, Mir Quasem Ali was in 1971 a first-year physics student at Chittagong College. This cataclysmic year saw “East Pakistan” — as it was then known — separated from Pakistan amid an infamous bloodbath, and it was for this bloodbath that Ali hanged 45 years later. At the time, he was a member of the Islamist student organization Islami Chattra Shangha;* in the autumn of 1971, that organ was tapped for recruits to the pro-Pakistan paramilitary Al-Badr which helped carry out wholesale massacres. 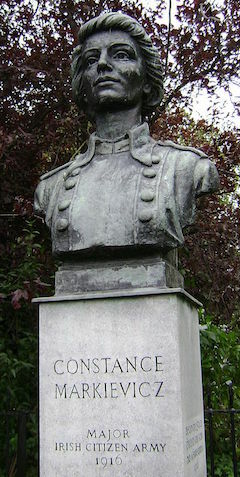 Some three million people are thought to have died during this war. The court that noosed him found that Ali helped to orchestrate the abductions of pro-independence activists to a three-story hotel in Chittagong commandeered from a Hindu family. 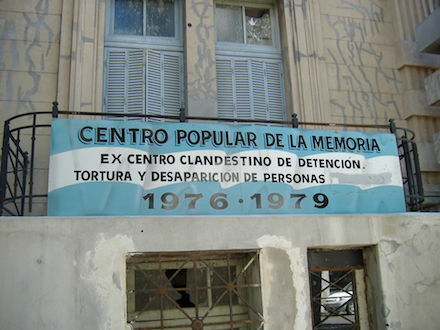 Victims there were tortured and some murdered, although others survived to tell of Al-Badr guards announcing the defendant’s arrival with the words “Mr Quasem is here. Mr Commander is here,” seemingly establishing quite a high degree of responsibility for events under that roof. After a bad result in the war, he fled to Saudi Arabia and embarked on the business career that would see him into the global oligarchy as a billionaire media mogul and (once back in Bangladesh) the chief financier of the chief Islamist party. When a score-settling Prime Minister Sheikh Hasina Wazed initiated a tribunal to try human rights crimes from the 1971 war, Mir Quasem Ali immediately started spreading millions around Washington D.C. lobby shops in an unsuccessful bid to use international pressure to shut down the proceedings. He maintained his innocence to the last, even refusing to seek a presidential clemency since that would have entailed an admission of guilt. 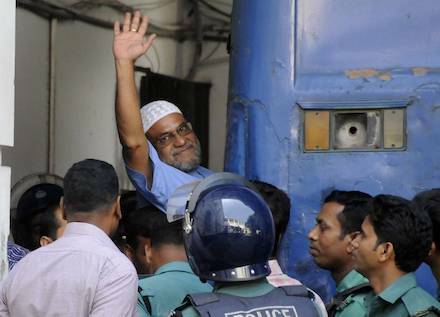 These trials, several of which have ended at the gallows, have been intensely controversial within Bangladesh, and without. * Its present-day successor organization is Bangladesh Islami Chhatra Shibir … which was founded in 1977, by Mir Quasem Ali. 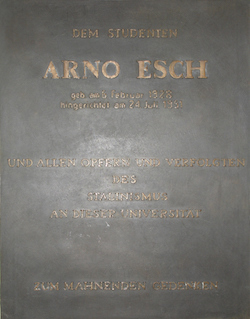 On this date in 1951, liberal East German activist Arno Esch was shot in Lubyanka Prison outside of Moscow. 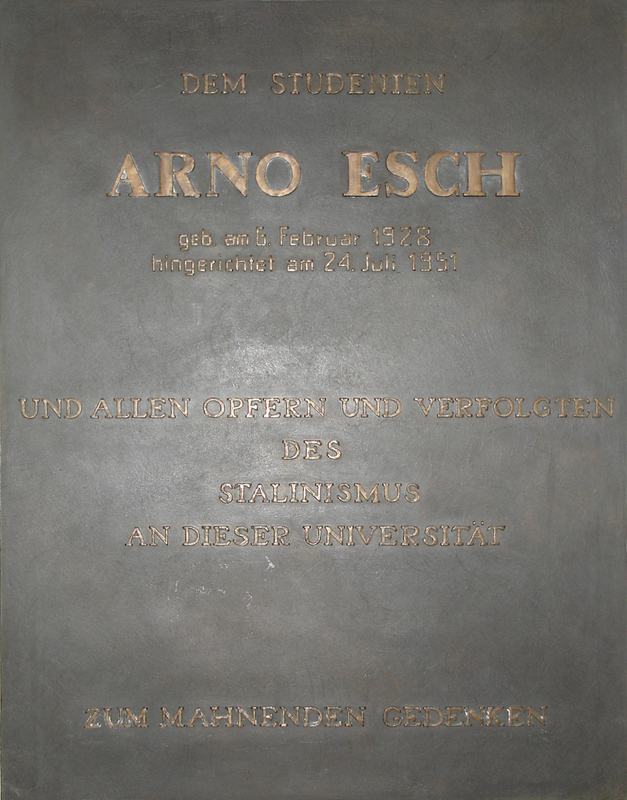 Plaque at the University of Rostock honoring Esch. (cc) image by Schiwago. Just 17 when World War II ended, Esch emerged as a leading student activist for the Liberal Democratic Party in the postwar Soviet Occupation Zone — a pacifist who advocated political liberalization and civil rights. 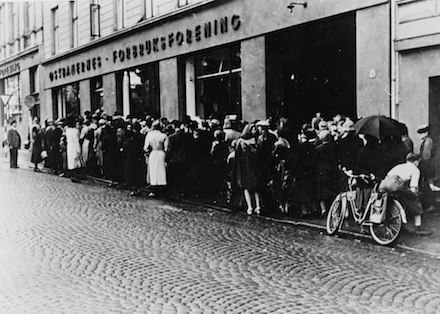 These weren’t times for any common fronts: “a liberal Chinese is closer to me than a German communist,” Esch remarked, denoting a clear and present danger in the communist zone: his party attempted in vain to form a coalition across the nascent Iron Curtain with its like-minded brethren in the western zones. 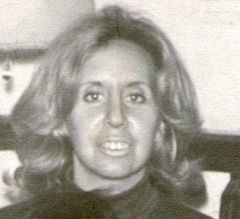 Esch was arrested in 1949 and prosecuted as a spy and counterrevolutionary by a Soviet military tribunal. On this date in 1974, Kurdish activist Leyla Qasim was hanged by the Ba’ath regime in Baghdad. 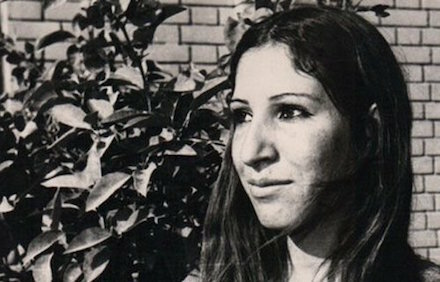 A middle daughter among four brothers from the heavily Kurdish Khanaqin district, Qasim joined the Kurdish Student Union as a student at Baghdad University in the early 1970s. The Iraqi government had fought a running war against Kurdish rebels throughout the 1960s, resolved only by a tenuous truce; by the spring of 1974 armed conflict began again. Visible Kurdish activists living right in the capital became a natural target. Qasim and four male companions were arrested in late April, accused of plotting against Iraq (various accounts have this down to a hijacking scheme or a cogitating the murder of Saddam Hussein). 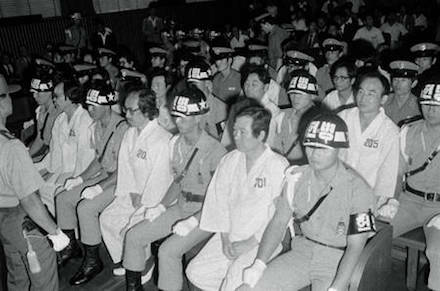 They were tortured, condemned in a televised trial, and executed together. She’s still regarded as a Kurdish heroine and many families confer her name on their daughters.